Achille Felicetti is a senior researcher at the VAST-LAB at PIN, Prato. He has a degree in Archaeology and a diploma in computer programming. He has coordinated several work-packages and development teams for the application of semantic tools to archaeological data, such as those developed in the EPOCH COINS and 3D-COFORM project. He coordinated the development of the ARIADNE semantic platform, the portal for the interoperability of archaeological information. He is currently coordinator of the CIDOC CRM CRMarchaeo extension for semantic encoding of archaeological information, and of the CRMtex extension for modelling entities related with inscriptions, manuscripts, papyri and other ancient texts. 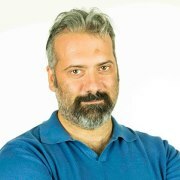 He is currently part of the PARTHENOS Platform Development Team for the integration of information in various disciplines, including History, Linguistic studies and Heritage Sciences. In the framework of the E-RIHS initiative, he is part of the development team of DIGILAB, the cloud infrastructure for the management of heritage science data. In EOSCpilot, he coordinates the team in charge of the TEXTCROWD Science Demonstrator.